Whew! Chocolate Bourbon Maple Bacon Cupcakes .. say that five times fast. Chocolate Bourbon Maple Bacon Cupcakes are my latest creation and I have to say, my brand new reason to wake up in the morning. IS THE BOURBON TASTE SUPER STRONG IN THESE BOURBON CUPCAKES? The bourbon taste in these Chocolate Bourbon Maple Bacon Cupcakes is not too strong but you cant taste there is a hint of it in there. The flavor is more pronounced in the Maple Bourbon Buttercream Frosting than in the cupcakes themselves. HOW DO I SERVE BOURBON CUPCAKES TO A MIXED CROWD? 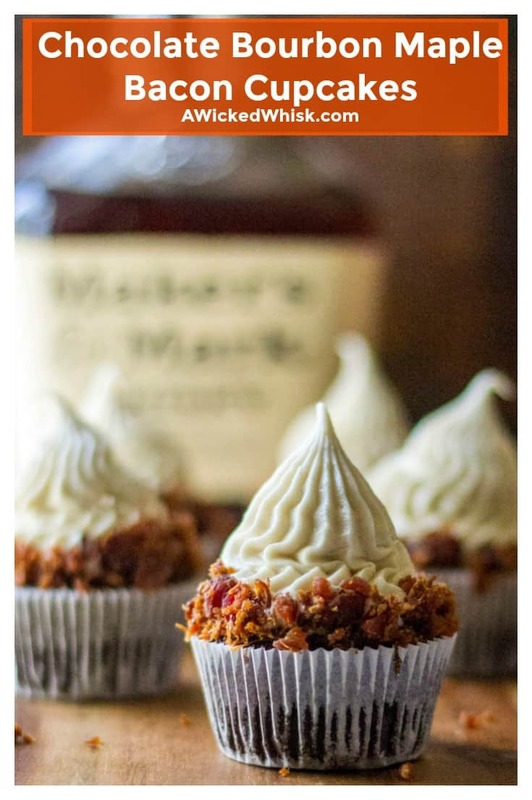 HOW DO I MAKE CHOCOLATE BOURBON MAPLE BACON CUPCAKES? Easy! To make your Chocolate Bourbon Maple Bacon Cupcakes, start by preheating your oven to 325 degrees and line a muffin tin with cupcake liners. 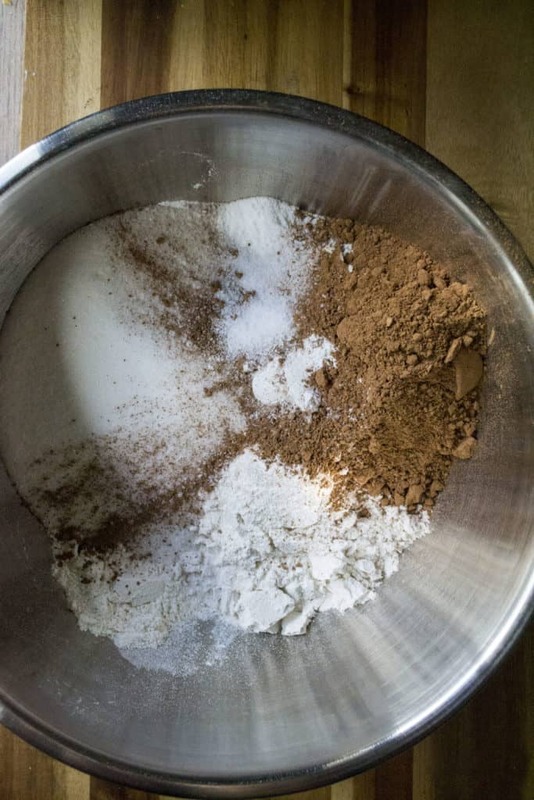 Adding your flour, sugar, cocoa powder, baking powder, baking soda, salt and espresso powder to a large mixing bowl. Stir the dry ingredients around to combine them and then add in the milk, vegetable oil, eggs, vanilla, bourbon and hot water. Mix to combine for 1 – 2 minutes and then spoon batter into your cupcake tins, careful to fill cupcake liners only about half way up. 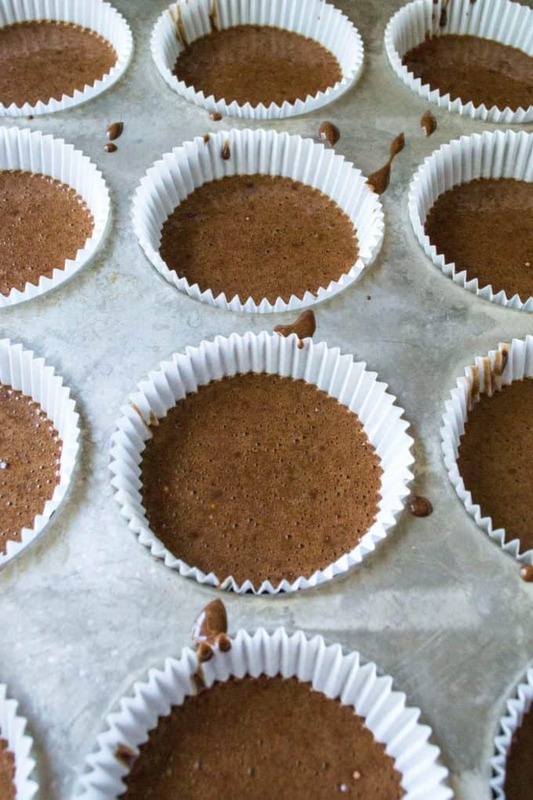 Bake for 19-22 minutes, remove Chocolate Bourbon Maple Bacon Cupcakes from the muffin tin and move to a cooling rack. While your cupcakes are cooling, cook off the bacon in a large skillet over medium high heat. Once bacon is cooked crisp, move bacon to a paper towel to drain the grease. Once the bacon is cool to touch, dice up and set aside. When cupcakes are completely cool, make your Maple Bourbon Buttercream Frosting. Start by adding softened butter to a large mixing bowl and beating until creamy. Sift in the powdered sugar and salt, then add in the maple syrup and bourbon and mix to combine. If the frosting is too thin, add in more powdered sugar, if it is too thick, add a bit of milk to thin the frosting out. 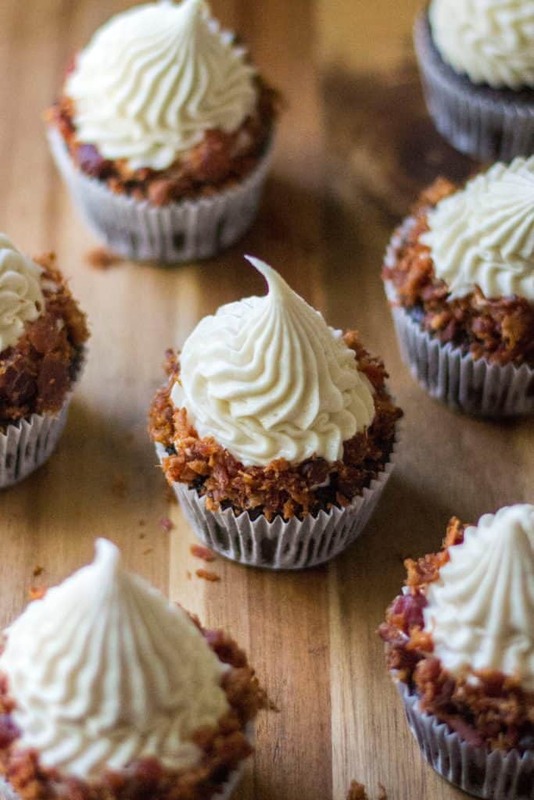 Frost your Chocolate Bourbon Maple Bacon Cupcakes and then using your fingers, lightly add the bacon pieces to the frosting and lightly press to make sure they stick. 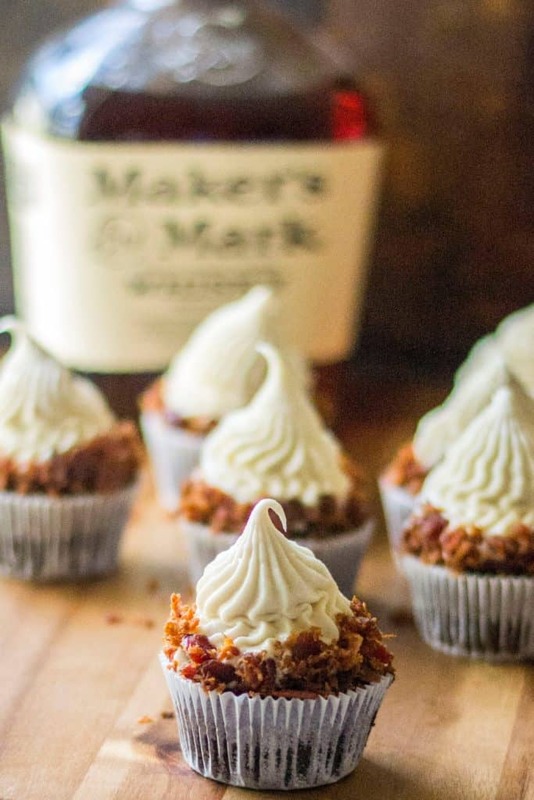 Note: I used Makers Mark Bourbon in this recipe for my Chocolate Bourbon Maple Bacon Cupcakes. That’s just my personal choice. 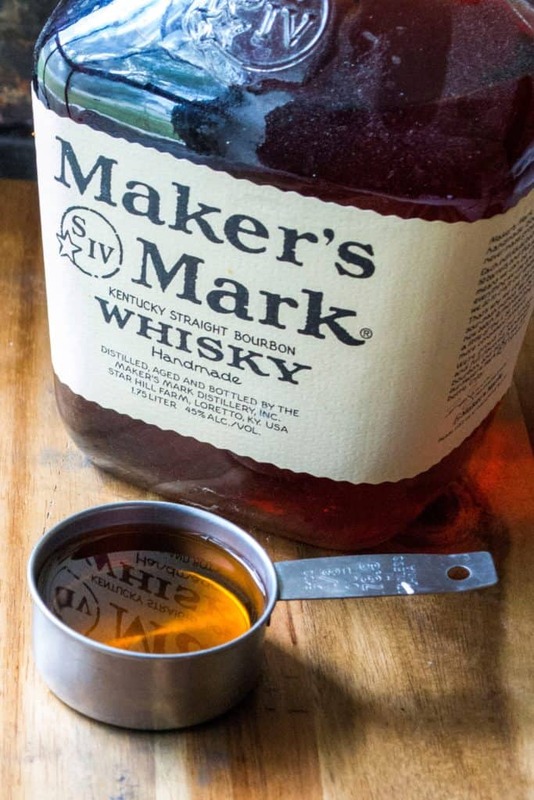 If you prefer the taste of another bourbon, feel free to substitute. 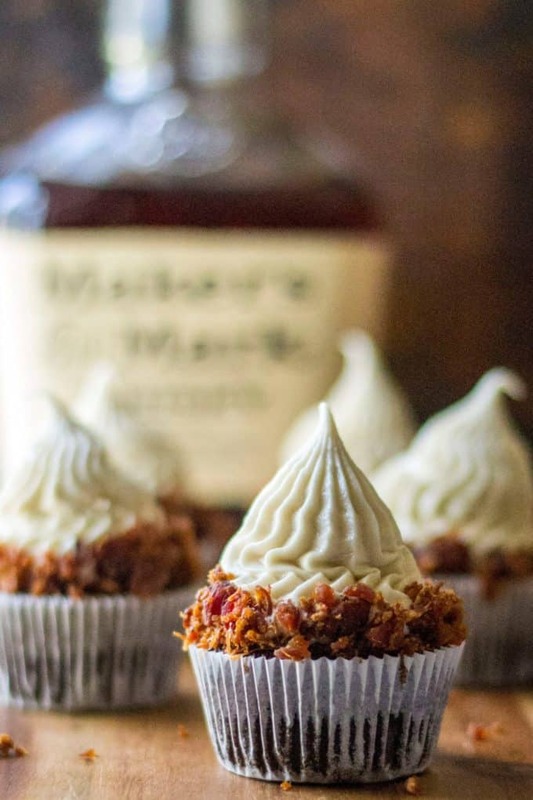 Chocolate Bourbon Maple Bacon Cupcakes are the perfect combination of moist, delicate chocolate bourbon cupcakes topped off with decadent maple bourbon buttercream frosting and then garnished with little pieces of crispy bacon. Perfect savory twist on a sweet treat classic, these Chocolate Bourbon Maple Bacon Cupcakes are amazing! Start by preheating your oven to 325 degrees and line a muffin tin with cupcake liners. Adding your flour, sugar, cocoa powder, baking powder, baking soda, salt and espresso powder to a large mixing bowl. Stir the dry ingredients around to combine them and then add in the milk, vegetable oil, eggs, vanilla, bourbon and hot water. Mix to combine for 1 - 2 minutes and then spoon batter into your cupcake tins, careful to fill cupcake liners only about half way up. Bake for 19-22 minutes, remove Chocolate Bourbon Maple Bacon Cupcakes from the muffin tin and move to a cooling rack. While your cupcakes are cooling, cook off the bacon in a large skillet over medium high heat. 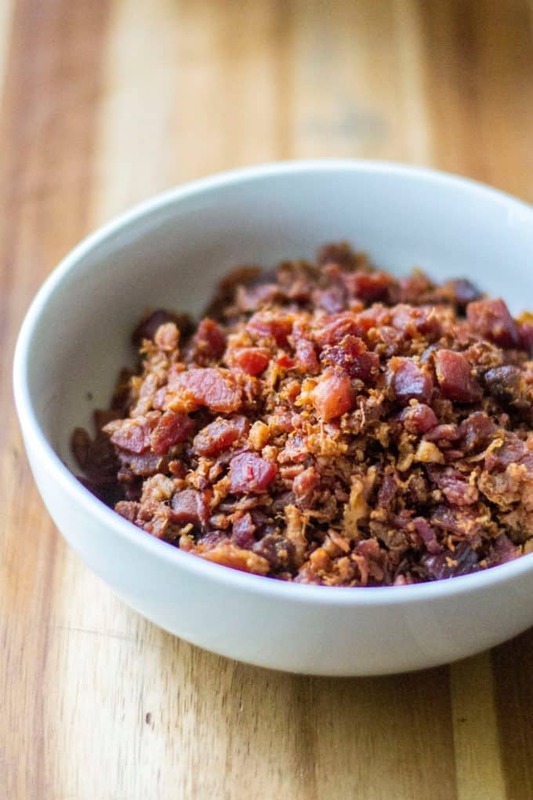 Once bacon is cooked crisp, move bacon to a paper towel to drain the grease. Once the bacon is cool to touch, dice up and set aside. Wow! That’s an idea I would never think of! Bacon on cupcakes! I think my other half would love these, and like you’ve said, they would be great for Father’s Day! These look so good! I could go for a dozen right now. I love the espresso in the frosting too that is a nice touch. Thanks for sharing a great recipe! What a favor combo! They look amazing! With every word that I read, I started salivating more and more. Chocolate + Bourbon + Maple + Bacon?! It’s basically all of the best flavors in dessert cupcake form. Can you mail me one of these please?! Frosting is killing me,just want it right away! These cupcakes look so delicious. I love cooking with bourbon! It’s definitely strong when you first add it, but cooking/baking mellows out most of that strength. These cupcakes look fabulous, and I would probably eat the frosting and bacon off all of them! Just about any cupcake flavor is good, but these are over the top! I love, love, love these flavors. It’s awesome that you used real bourbon and not an extract. Can’t wait to give these a try! Maple bourbon buttercream. Wow. I mean, the cupcakes sound interesting, but that frosting! What an interesting combo. So creative and delicious.Pining it for later. These cupcakes are perfect for Father’s Day for any man with a sweet tooth. Love this idea lady!